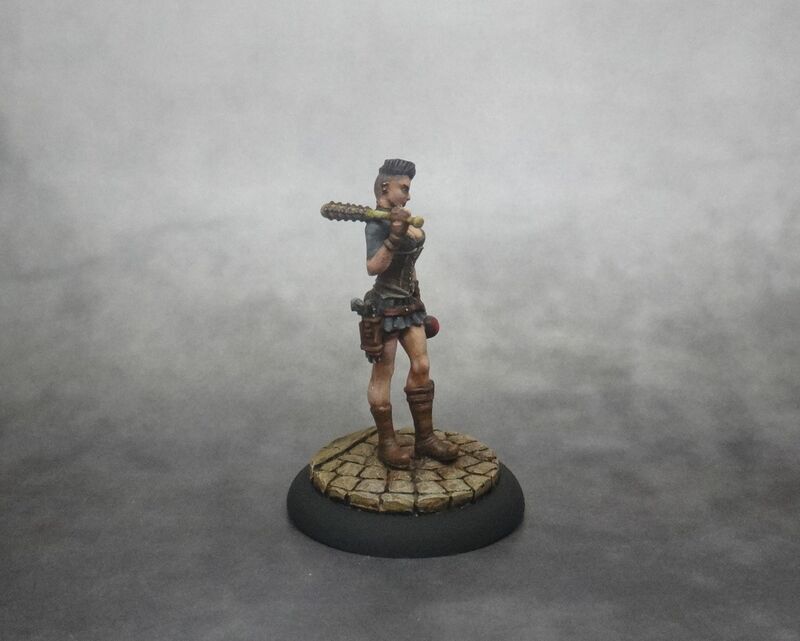 Miss Anne Thorpe is a wastrel and happens to be the latest limited miss model released last Gencon by Wyrd Games. This time she is dual faction and can be hired in both Guild and Ten Thunders (crews led by McCabe). In the world of the game Wastrels are children of rich families and the all have a vicious side to them. 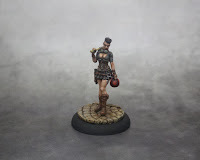 Getting to Malifaux allowed them to explore it... with impunity. Wastrels are on the cheap side and they function mainly as decent scheme runners and support minions. They have some nice offensive and defensive tricks but you can't really expect much from a 4ss model. Miss Anne Thorpe to ostatni z modeli miss wydanych przy okazji Genconu przez Wyrd Games. Tym razem posiada cechę dual faction i może być użyta w ekipach Gildii oraz Ten Thunders (dowodzonych przez McCabe'a). 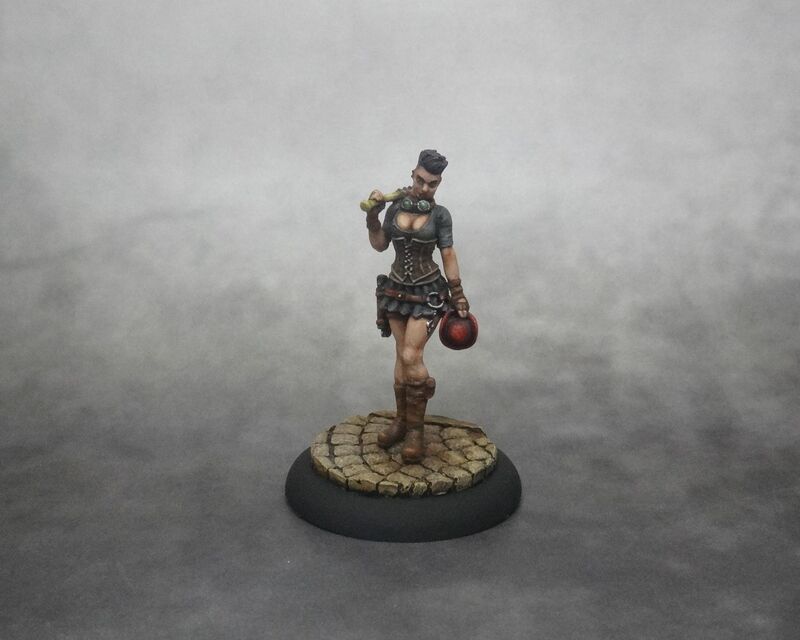 W świecie gry "darmozjady" to na wskroś złe dzieci zamożnych rodzin, które zostały wysłane do Malifaux, by móc bezkarnie eksplorować mroczną stronę swojej natury. Należą do najtańszych jednostek i funkcjonują głównie jako przyzwoici scheme runnerzy albo jako jednostki wspierające. Mają parę ofensywnych i defensywnych trików ale też nie można oczekiwać rewelacji po modelu za 4 ss. 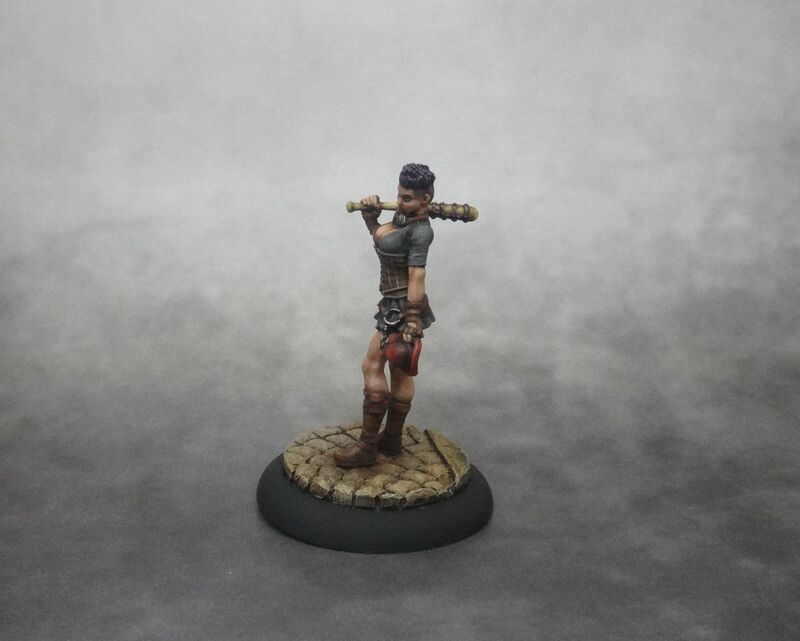 The miniature itself is very nice and has a few assembly options with some extra arms and heads. 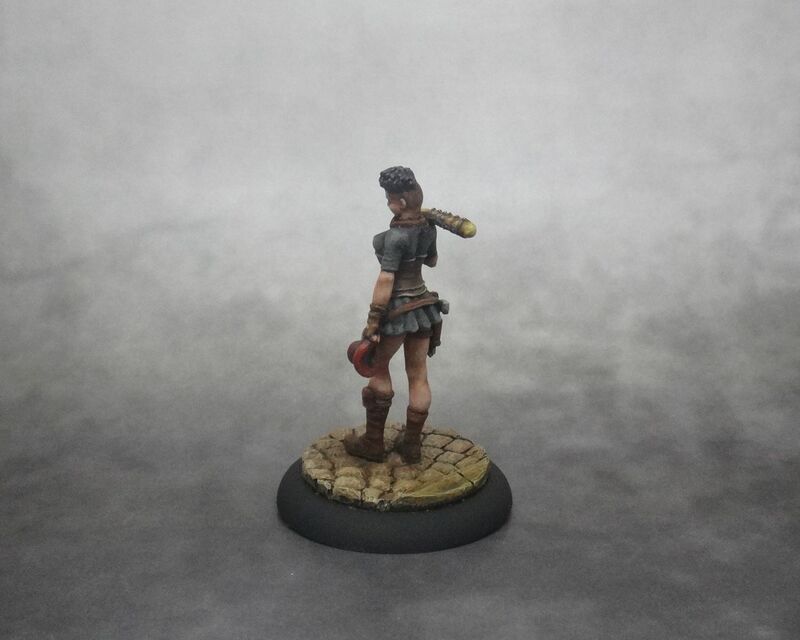 It's probably the first mini of this type that looks like an actual miss. The designers have certainly put extra effort into making sure she looks like one. 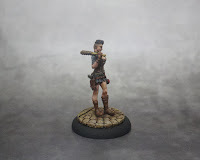 As far as painting is concerned, I tried to more or less stick to the artwork, which wasn't easy as the colors used by Wyrd artists are typically dark. Sama figurka jest bardzo ładna i co ciekawe ma parę alternatywnych wersji do złożenia dzięki dodatkowym ramionom i głowom które znajdziemy na wyprasce. To chyba też pierwsza figurka tego typu, która naprawdę wygląda jak miss. Projektanci zdecydowanie dołożyli starań, żeby na taką wyglądała. Jeśli chodzi o malowanie, to trzymałem się raczej wzoru z artworka, co nie było łatwe, bo artyści z Wyrda lubują się w ciemnych barwach. While painting this mini and several others I've shown on the blog recently, I was listening to the Empire trilogy by Raymond E. Feist and Janny Wurts. I read some of Feist's novels (the Riftwar and the Serpentwar saga along with some stand-alone titles). I thought it might be interesting to return to this universe after a long break and decided to start with the Empire Trilogy as this seemed like the most reasonable choice (at least as far as chronology is concerned). The series follows the story of Mara, a young noble who has to stop her temple education as her father and elder brother are killed in a political intrigue. She is forced to enter the Game of the Council, a relentless and cruel struggle for power in the empire of the Tsuranuanni. The books read quite well even though at times it seems like they could be a bit more complicated as it seems like some of the problems faced by the protagonist are too often "miraculously" solved. Despite that, it wasi nteresting to see a different perspective on the Riftwar and learn more about Tsuranuanni society and its strict honor code. I thought the parts about Black Robes were the most interesting. 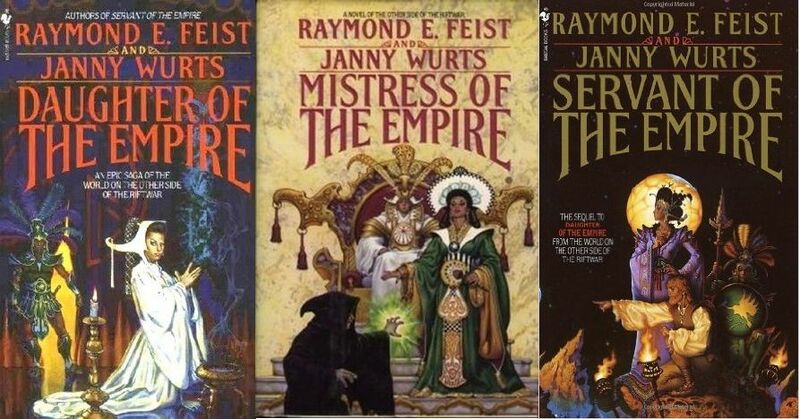 This elite assembly of magicians that functions outside law was already presented in previous novels by Feist but here more was revealed about their hidden agenda. I've also read a very nice book I got as a Christmas gift from my wife. 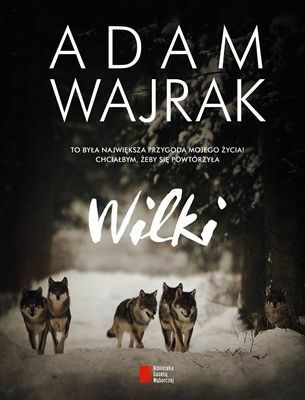 "Wilki" (Wolves) by Adam Wajrak is a fascinating journey into the Białowieża Forest, where the author has spent a big part of his life, working as a correspondent for one of the biggest Polish newspapers. He got a chance to observe nature closely, and to learn about wild animals and their habits. Wolves have always fascinated me so it was really great to get more insights into their lives and learn more about how a pack functions. The author debunks many myths about these magnificent animal. He is really passionate about his job and this shows as the book reads very well. There are also some really spectacular pictures in it. 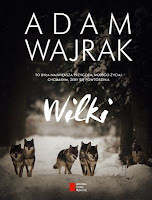 I enjoyed reading it thoroughly and will probably try to read some of the other works by Wajrak. Kurczę ale ładny model. Profesjonalnie pomalowany. Podstawka z kocich łbów przykuwa uwagę - to samoróbka czy jakiś gotowy odlew ?